Spanish garlic soup is a miracle. You fry garlic cloves (Teresa Barrenechea calls for just six) and stale bread in olive oil, add hot water, paprika, and salt and cook until the bread falls apart. In just over half an hour you have an easy, frugal, and hearty soup dinner. For me anyway. Not for anyone else in my family. Last night's garlic soup was loathed. Midway through the meal I looked over at my husband and thought he'd gone and gotten himself seconds because his bowl was full. He hadn't gotten himself seconds. Isabel said, "I'm just not that into soggy bread, Mom." I love soggy bread. There are a lot of recipes for garlic soup on the internet, but many of them call for chicken or meat stock. Why use stock when water works fine? I wouldn't. If you want to try the recipe from The Cuisines of Spain, you can find it here on page 161. Fried milk for dessert. Extremely seductive concept and Barrenechea writes that it's one of her favorite desserts.You make a milky cornstarch pudding and chill it in a brownie pan until firm. Cut in squares, dip in beaten egg, and fry in olive oil. The fritters should have looked like this, but I was sloppy and rushed and put too many squares in the hot oil so the temperature dropped and the egg coating slipped off. The leche frita was greasy and disgusting looking, though very tasty. I don't think I am into soggy bread either. But I have never tried it, so I might love it. The Italian bread soup has always turned me off as well. I did try to make soup from the leftover stuffing from T'giving. It wasn't terrible, but it wasn't great. I am intrigued by the fried milk. Did the family like that? You know? They did like that fried milk. It was yummy. I was surprised at how interested they all were given its bad appearance. This leche frita is a thing I must research further. When I was a student in Florence we used to go to a lunch place near the central market that served this soup, vegetables and broth poured over a thick slab of stale Italian bread, that I loved with a fiery passion. Gruff Italian merchants bellied up to the communal table cheek by jowl with us and drank red wine out of tumblers and ordered this soup, followed by pasta and maybe even a meat course. I just had the soup. Oh, the soup. The soggy bread soup. Love. I have loved soggy bread in any form since I was a very small child and discovered how fabulous it was to dunk my buttered toast into my Cream of Wheat. I'd wait till the toast went semi-soggy and then scoop the buttery, sugary, milky bread into my mouth. 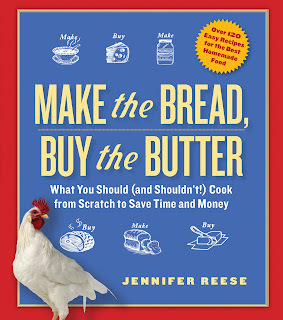 I checked out Make the Bread, Buy the Butter from the library less than 24 hours ago and have read it cover to cover. All the way through I kept stopping to say to my husband, "She is just like me!" (To which he responded, "Crazy?"). I recently acquired a small flock of laying hens and pondered meat birds including turkey. I paid $15 for a tiny local free range chicken at the farm's market last summer and it was not even very good. I too struggle with ethics vs. cost. I still work full time so I can't make everything from scratch but would love to! Needless to say I love your book! I still break out the garlic soup from Moro (which I have thanks to your blog posts) when trying to impress, though that recipe is more generous with the garlic!